So, as I mentioned in my intro post, I'm a newbie when it comes to WoW, although have played lots of other RPGs. 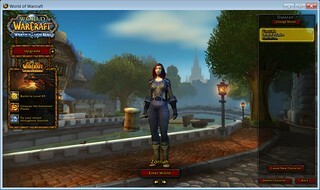 I created a new character in WoW this week. The character creation process was actually pretty familiar to me, since I've created lots of other avatars in other games. Actually, creating an avatar is usually one of my favorite parts of a game, since I really like customizing how she or he looks as well as choosing the skills, abilities, and class. My new character's name is Zorriah and she is a human Paladin. I tend to like playing Paladins, since they can do a decent amount of damage, they can wear most armor, and they usually have some sort of healing ability too. I also like playing clerics or priests, but since I'm leveling mostly solo right now, I thought it would be better to start with a character that is a little more self-sufficient. Right now, I'm only level 5, but I hope to work her up to a higher level soon. Here's a link to a screenshot of Zorriah. P.S. Is there a way to embed the image in the post? I couldn't seem to get it to work when I used the "insert image" button in the toolbar, so did a text link instead. I think the idea of having someone who has some strengths and balanced abilities is a good choice if you are leveling up solo. Have you had time to do any more back story, I am always so interested in what players imagine their avatar's lives prior to their creation? [b]I do want to know all about your character's life up to now, those back-stories are so important and fun to construct. Personally I loved the back-story for my character in StarTrekOnline, "Dilt" a female Ferengi captain, direct descendant of Quark :), that is the only character for whom I had constructed a very involved back-story. So glad to make the acquaintance of your beautiful avatar. There is and thanks for asking! 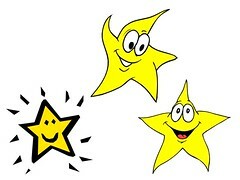 In the Week 2 Overview, we are encouraging everyone to add a picture directly into their post. So yes we'd love to see your avatar! LeeDale did this mockup of how to take the code from Flickr and post your picture directly. First go to flickr and find the picture. 1)There is this little icon, in the bottom left-hand corner. It looks like an envelope with an arrow. Click on it. 2) That opens up the white pop-up that you see. Click on HTMLcode/BBCode and check on the bottom to look for the BBCode. Shivtr uses BBCode. 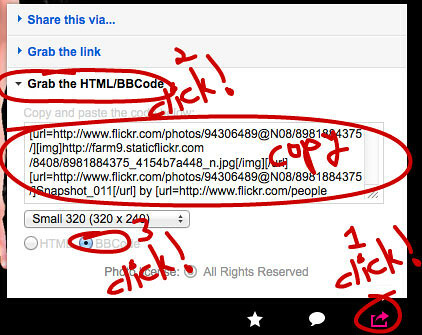 3)Make sure the BBCode has been chosen. Copy the code! and paste directly into the discussion forum post. That's how we add all of these pictures! Zorriah grew up in a small farming village. Orphaned at a young age when a wandering band of trolls attacked the village and killed her family, she was taken in by the local priest as his ward until she came of age. The kindly priest taught her minor healing spells and instructed her in language, religion, history, and self- defense. When Zorriah turned 18, she decided to strike out on her own as an adventurer. Much as she loved her mentor and guardian, a cleric's life in a small village was not for her. Her love of history and legends had given her a taste for adventure and she wanted to see the world and make a difference. And so, Zorriah joined an order of paladins and pledged to fight evil, protect the innocent, and bring peace and justice to all the realm. That is great Calliope Codex, I knew you could do it! I love the back-story. It is such a good character to show overcoming adverse conditions in your youth whey you might be put upon by others (darn trolls) and yet have an inner strength supported by a mentor and transform into an even stronger person who now will fight to bring justice to others. Joining a like-minded supportive group gives a sense of family, as an anthropologist we call this "fictive kin" those whom you are not related to by blood, but serve as family to you and you think of them as members of your family. Nice presentation and good second effort on getting that image embedded! I've created lots of other avatars in other games.